Sorry... the 2017 Nissan Rogue Hybrid is no longer being sold as new. Instead, take the first step to a great deal on 2018 Nissan Rogue Hybrid with a free price quote! Nissan gave its popular Rogue SUV a slew of updates for 2017, including a new hybrid variant. The Rogue remains one of the few compact SUVs to offer a third-row seat, which increases seating capacity to seven. Nissan says the 2017 Rogue will hit dealerships in early November, while the Rogue Hybrid, which is two-row only, will go on sale by the end of the year. When Nissan slapped its "V-motion" grille on the redesigned Maxima and Murano, then added it to slew of refreshed models, it was only a matter of time before the Rogue got the same. It's wider than the previous (and already V-shaped) unit and the grille overtakes more of the nose, with framework that extends farther down the bumper. The headlight bezels are now more clearly defined, while the arrow-shaped LED accents are more restrained. The fog lights sit in new, L-shaped insets. Less has changed in back. The bumper has taller cladding and the taillights are a bit darker, but other elements are otherwise unchanged. The available power liftgate now works with motion activation. The cabin gets a racier steering wheel and new, stitched accents on the passenger-side dashboard and around the gearshift. The shifter adds a leather boot, too. The available leather upholstery can optionally come with quilted inserts. The second row folds in a 40/20/40-split fold. In models without the optional two-seat third row, Nissan offers a cargo-organizing system with 18 adjustable variations. The Rogue Hybrid lacks the cargo organizer or third row, and its backseat folds in a 60/40-split. The center controls carry over. A 5-inch center display, Bluetooth phone and audio streaming, USB port and backup camera are standard. Options include dual-zone automatic climate control, a power driver's seat, 7-inch touch-screen with navigation, a 360-degree camera system, keyless access with push-button start and Bose premium audio. New options for 2017 include a heated steering wheel and memory system for the driver's seat. Apple CarPlay and Android Auto are unavailable, however. The Rogue's standard drivetrain remains a 170-hp, 2.5-liter four-cylinder that pairs with a CVT. The Rogue Hybrid combines a 2.0-liter gas engine with an electric motor, which draws power from a lithium-ion battery, for a total 176 hp. Both powertrains offer front- or all-wheel drive. 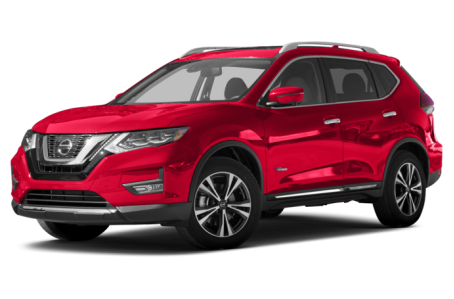 Nissan estimates the non-hybrid Rogue will earn combined EPA mileage in the high 20s, while the Rogue Hybrid will get 34 mpg combined with front-wheel drive and 33 mpg with all-wheel drive -- the latter figure matches Toyota's all-wheel-drive RAV4 Hybrid. The Rogue now offers forward emergency braking with a pedestrian-detection function. Lane departure and blind spot warning systems are also available, as is adaptive cruise control.